Another week, another birthday in the world of triathlon events. Last week, our preview of the Nokia Windsor Triathlon was celebrating 20 years of the iconic race by the River Thames. This weekend, the fifth running of UK Ironman 70.3 at Wimbleball Lake represents the 10th birthday of the UK's half-distance Ironman event. Having been at year two of Windsor (1992), your Editor manages to go one better this time having raced himself in year one (2001) of what, at that time, was known as Half Ironman UK, later becoming UK Ironman 70.3. Race one took place in Llanberis, North Wales, and since then the event has been to Sherborne Castle and Longleat House before finding its home - for the fifth time this year - at Wimbleball Lake. Wimbleball is renowned for being arguably the toughest Ironman 70.3 race out there - a title that was well earned in 2006 when the inaugural winner, Chris McCormack claimed as much. "The course doesn't let you get into a rhythm. There are lots of hills - 52 in 56 miles - but they are all different" Race Organiser Alison Boon told us. "Also, there are quite a few hills on the run too. We always get comments back from people after the event that they had put so much preparation, focus and effort into the bike course, that they then found the run much tougher than they expected." In common with Windsor, Wimbleball has - generally - been very lucky weather wise, though Alison Boon tells us "one year there were hail stones out on the bike course, yet in transition the weather was lovely!". Last year the race also suffered a delay with fog on the lake, "you literally couldn't see anything at the lake - yet just up the hill in transition it was clear. But, as quick as the fog came, it then went away." The 2005 race at Longleat was actually the first 'Ironman 70.3' race ever to be held, when the WTC Ironman 70.3 series was born. Check out Henry Budgett's excellent article if you want to learn more about the origins on that. If you believe the statistics, there are quite a number of Ukrainians present to race... clearly the difference between 'UKR' and 'UK' was a little difficult for many when entering online. There is also a "British sounding" Afghan and another from Uzbekistan ...those being the first and last options on the entry list - clearly a few twitchy fingers at the keyboard! Even allowing for these funnies, the race has still attracted entries from over 30 different countries. As well as a handful of "repeat offenders" who will be racing their 10th UK 70.3/Half Ironman, there are also 1018 'virgins' to the distance...good luck to you all. In total there are nine athletes who have entered all of the '70.3' races, starting in 2005: John Flint, David Gilkes, Michael Humphreys, Bryn Mayell, Jonathan Miller, James Poole, Frank Smith, Charlie Stannet and Steve Taylor. While there are an increasing number of racing options for the elite, the 2010 race - for the men in particular - promises to be an exciting race, with the 'Best of British' against some top international athletes, including two for Ironman World Champions. 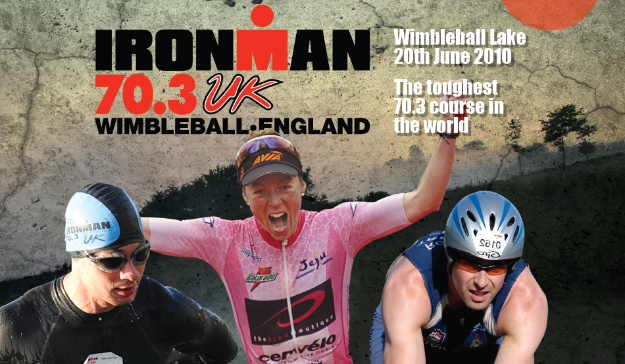 2006 winner, and 2007 Ironman World Champion Chris McCormack returns to take on the challenge of Wimbleball, and he will be racing alongside Germany's Faris Al-Sultan, himself an Ironman World Champion. "We're not sure whether Somerset is ready for Faris in his Speedo's!" said Alison Boon. Defending Champion Philip Graves will be aiming to retain his title (you can read his 2009 report HERE). Stephen Bayliss has finished second for the past two years, but never won in Wimbleball, and will be aiming to correct that this season. As a British athlete, does it put give importance to you on winning your ‘home’ event? "For sure, winning the one and only 70.3 that we have in the UK means a lot to me, and as such it has always been one of my goal races for the season and I have worked towards the race with a lot of attention to detail." Having won in 07/08, does that provide even more incentive to get the title back after last season? "Yes - winning back to back is something I am very proud of, so if I could add a third title I would be delighted, without question." Faris and Macca are lined up to race too - that must add even more prestige, were you to come out the winner? "Absolutely, but at the end of the day I can only control my race, go as hard as I can go on the day, and what will be will be. If I win then fantastic, but as long as I have emptied the tank I will be satisfied. But for the event as a whole it will hopefully be a cracking race if everyone is on the startline, including of course Phil and Stephen. I can't wait." 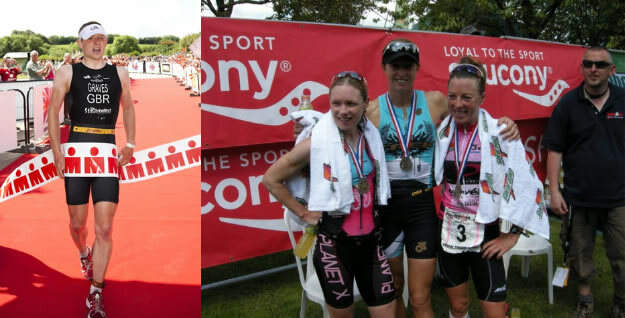 In the ladies race, 2008 winner Bella Comerford will start as favourite, though will surely have to work hard on the bike and run to catch super swimmer Lucie Zelenkova. The race also provides the opportunity for the likes of Emma-Kate Lidbury, Tamsin Lewis, Yvette Grice and Joanna Carritt to aim for the podium. Much like Windsor, the winners list from UK Ironman 70.3 makes for impressive reading, with a host of World Champions across Ironman, Ironman 70.3, XTERRA, ITU Standard, ITU Long, ITU Duathlon (Standard and Long), having won the event over the past nine seasons. 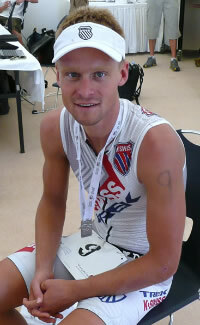 Richard Allen won the fist event in 2001, and he will be racing again this weekend too.